Going somewhere fun this summer? Or, having a productive stay-cation? Draw, paint, or mix up your media on a postcard-sized paper and mail it to Wet Paint! We’re putting together an exhibition of mail art from our friends and fans wherever they may be. As postcards arrive, we will photograph them to share on our social media pages and then display them in our storefront windows. At the end of the summer, we’ll host a public art opening here at Wet Paint for all of the contributing artists! There’s no limit to how many postcards you can send, but in order to participate, postcards have to arrive at Wet Paint via our friendly postal carrier – – no dropping them off at the store! Don’t forget to sign your postcard(s) and let us know how to reach you. We want to make sure we’re crediting you when we post the work online and we want to be able to contact you with details about the end of summer art opening on August 18th, 2017. -We are a family-friendly shop, so please tailor your images & words to be suitable for viewers of all ages. -We reserve the right to not display postcards that we feel are inappropriate for this activity. -All artwork must be original. -In order to have your postcard displayed in our end of summer exhibition, you’ll need to have it postmarked by August 11th, 2017. -All participating mail art must arrive at Wet Paint via US Mail. -Keep in mind that postcards will “wear” a bit depending on how far they travel- which is part of the fun of mail art! -Contact your local post office for shipping and postage information. -Send one or send one every week! We’ve got big windows! 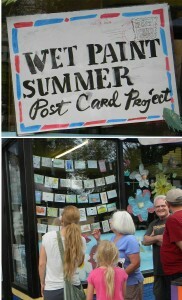 Categories: Events at Wet Paint | Tags: art supplies, event, mail art, Postcard Project, Wet Paint St. Paul | Permalink. There’s no limit to how many postcards you can send, but in order to participate, postcards have to arrive at Wet Paint via our friendly postal carrier – – no dropping them off at the store! Don’t forget to sign your postcard(s) and let us know how to reach you. We want to make sure we’re crediting you when we post the work online and we want to be able to contact you with details about the end of summer art opening on August 8th, 2016. -In order to have your postcard displayed in our end of summer exhibition, you’ll need to have it postmarked by August 2nd, 2016. Categories: Events at Wet Paint | Tags: art supplies, event, Postcard Project, Wet Paint St. Paul | Permalink. We have such a wide and ever-expanding selection of journals/notebooks/pads at Wet Paint, we thought it would be fun to feature some of our staff favorites. Stay tuned to find out more about what we stock and maybe find a new favorite for yourself! This innovative line of pads brings you art lessons from the most popular instructors. Each pad includes step-by-step instructions on quality Strathmore paper. Pads also come with follow-along online video tutorials for an integrated learning experience. Paper is very good for pencil, colored pencil, charcoal and sketching stick. The first 3 products in the Learning Series line feature instruction from Christopher Hart, the world’s bestselling author of how-to-draw books. Click here to see all 3 pads in the Learning Series! Categories: This just in! New products we are excited about | Tags: art supplies, Staff Picks, Strathmore Learning Series, Virginia McBride, Wet Paint St. Paul | Permalink. Stillman & Birn stands out in the crowded sketchbook market, offering a unique collection of archival quality, premium sketchbooks designed to work with many different kinds of media. Only Stillman & Birn offers a sketchbook system, allowing the artist to choose the paper weight, shade and surface type to suit their specific techniques. All their papers have both internal and surface sizing, providing exceptional wet strength. All their papers are true art papers that withstand multiple erasures and are suitable for precision work. The Alpha series features heavyweight 100lb./150gsm paper and it has a natural white vellum surface intended for all dry media and will accept light washes. It is available in both hardbound and wirebound formats. Click here to see the entire Stillman & Birn line of sketchbooks! Categories: This just in! New products we are excited about | Tags: art supplies, Liz Carlson, Staff Picks, Stillman & Birn, Wet Paint St. Paul | Permalink. The French notebooks with a cult following! Rhodia is known for high quality, exacting standards and timeless design. These economical pads are a favorite of artists & designers, writers, notebook fans and people who like to use graph paper for notes, sketching and hand drafting. People love them for their smooth paper & iconic cover- the classic orange has been around since 1934! Today, they have expanded their selection to include blank, lined, and dot paper and are available in a variety of formats, colors, and styles. Click here to see our selection of Rhodia Pads! Categories: This just in! New products we are excited about | Tags: art supplies, Kate Katzer, Rhodia Pads, Staff Picks, Wet Paint St. Paul | Permalink. Click here to see all the options! Plus, for Earth Day, we have them all 20% off now thru 4/24/16! Categories: This just in! New products we are excited about | Tags: art supplies, Decomposition Books, Michael Roger Press, Staff Picks, Tina Monje, Wet Paint St. Paul | Permalink. These sweet little 3.5″ x 5.5″ minimalist notebooks – grouped economically in 4 packs of warm or cool colored covers – are convenient go-to journals that you’ll want to stash in every bag. EcoQua pads are perfect for writing and drafting with pencil, ballpoint pens, fountain pens, and marker pens. Made in Italy of Environmentally-friendly, FSC certified paper that’s Chlorine-free, acid-free, and completely recyclable. Choose from blank or dotted paper. Click here to see our selection of Ecoqua! Categories: This just in! New products we are excited about | Tags: art supplies, Beth Bergman, Fabriano Ecoqua, Staff Picks, Wet Paint St. Paul | Permalink. The sewn and gauze-spliced bindings of the K&P make for a strong and durable sketchbook. This unique binding method allows the books to open flat and beyond without damage to the binding. The heavyweight acid-free paper is an excellent support for all dry media and is suitable for water-based markers and light washes. It is also pH buffered lignin and chlorine-free. On the outside, gray binders board covers are bound with linen spines. These distinctive spines are available in five different colors. The books themselves are available in a variety of popular sizes. Click here to see all the styles in this line of sketchbooks! Categories: This just in! New products we are excited about | Tags: art supplies, Kunst & Papier, Paul Damon, Staff Picks, Wet Paint St. Paul | Permalink. The creative and unique theme designs make the Croquis Book and Pad line from Holbein a new favorite. Each pad includes 70 sheets of natural white 60g drawing paper that is neutral pH. With cover illustrations and designs by well-known Japanese artists, plus the economical price, these are sure to stand out when choosing your next pad. Click here to see the entire line of Croquis Pads & Books! Categories: This just in! New products we are excited about | Tags: art supplies, Holbein Croquis Pads, Staff Picks, Verra Blough, Wet Paint St. Paul | Permalink. Check out Anna’s blog “Sketchy Attire” here! Deluxe European notebook with a patented 360° binding. Click here to shop the sizes and colors! Categories: This just in! New products we are excited about | Tags: Anna Miller, art supplies, Prat Flexbook Sketchbook, Staff Picks, Wet Paint St. Paul | Permalink.